To some extent, watches can be compared to vinyl music, with the exception being that watches have somehow remained as popular as ever. Most people have no desire to buy old-fashioned vinyl music records anymore because digital music is so much more convenient in today’s world. A lot of people thought watches would suffer the same fate, given that virtually everyone has a mobile phone which they can check whenever they need to know what the time is. Nonetheless, watches have a distinct advantage: A watch is so much more than just a timepiece; it’s a piece of jewelry; a fashionable extension of your individuality. Of course good watches often come with price tags that make your eyes water and this has prompted many people to shop for cheap watches online. There are many vendors out there offering really good deals, but we will only be looking at one very popular distributor through this Discount Watch Store Review. The company has also expanded, and now stocks an impressive collection of sunglasses; handbags; writing instruments and etc. However, watches remain their primary commodity. The Company has an A+ Better Business Bureau rating, and it would seem, a rock solid all round reputation. 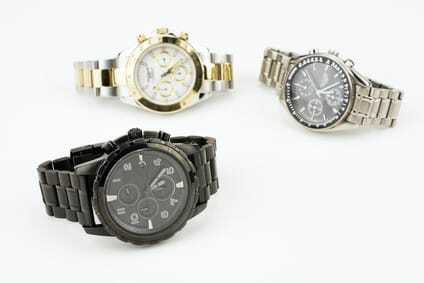 The company guarantees that all watches shipped are brand new and 100% authentic. They do not stock any fakes or replicas. Additionally, according to the company’s website, all watches are manually inspected when they arrive at the warehouse, and again prior to being shipped out to their customers. One can browse at leisure before placing an order – Discount Watch Store has an extensive catalogue of watches, so it is nice to be able to study it at your own pace without there being any pressure to make a decision. Free Shipping within the USA – Free Standard Shipping is available with all watches in stock. Guaranteed authenticity – All watches are inspected and guaranteed to be 100% authentic. Excellent prices – Probably the most reasonably priced you are likely to come across. Massive variety to choose from – With more than 65 watch brands and over 4,500 styles to choose from, it is virtually impossible not to find several watches that really appeal to you. All watch brands are authentic – Discount Watch Store only stocks and sells watches and other products that are 100% authentic. Unlike with some popular online auctions, there is absolutely no chance of you receiving a fake or replica watch. Low prices – The Company strives to offer their customers the lowest possible prices, and they back this up with a Price Guarantee as well. If you find the same watch somewhere for less than their price, they will undercut that price by 4% or $12, depending which is less. Original documentation and Warranty – All watches are shipped in their original packaging, along with all documentation and a warranty. Depending on which watch you buy, warranties are honored either by the manufacturer or by Discount Watch Store. Peace of mind – Discount Watch Store has an A+ Better Business Bureau rating, which essentially means you can shop with confidence. They also have a Trust Rating of 100 on the Scamadvisor.com website. Defects are rare – According to their website, all watches are manually inspected on arrival, and again prior to them being shipped. When the Company first launched, they found that less than 2% of the watches arriving at their warehouse had defects. While this is a very low number, management decided to try and eliminate all defects by implementing an “inspect twice” policy. Free local shipping – All orders within the United States and Puerto Rico qualify for free Standard Shipping, while international orders are shipped at the lowest rates available. Generous Money Back guarantee – Unlike many of their competitors, Discount Watch Store offer a 90 day Full Money Back Guarantee. It is worth noting that in order to qualify for the refund, products must be returned in their original condition, along with all packaging; labels; tags and etc. Not all popular watch brands in stock – While the Company admittedly does stock a massive selection of watches, they unfortunately don’t stock a number of sought after brands, including Rolex; Breitling; Tag Heuer; Omega and etc. Don’t ship to all countries – Orders can be shipped to most countries, but there are a few which have been excluded due to various reasons. For more details see the “Geographical Availability” section further down the page. Price matching guarantee difficult to understand – Some customers have reported that Discount Watch Store has refused to match a lower price even after sending them a link to the same watch on a competing website. In all fairness, it seems in most cases this was likely due to customers not really understanding the Company’s terms and conditions for their price match guarantee. Citizen watches only available locally – Unfortunately, the Company is unable to ship Citizen watches outside of the United States, although this could change. All prices are listed in US$ and vary from one product to the next. Prices are adjusted periodically in order to maintain a competitive edge over competitors. The Company also offers a price matching guarantee, subject to their terms and conditions. Standard shipping within the USA and Puerto Rico is offered free. 1. As is often the case with online shopping, you should consider contacting the company, asking them to verify that the watch you intend buying is identical to the one shown on their website. 2. Visit their FAQ page and read through the terms and conditions regarding their price matching guarantee. If you don’t fully understand everything, then just contact their help desk. Of course if you are happy to pay the listed price then there is no need to do this. Summary Discount Watch Store carries more than 65 watch brands, and at any given time they have more than 4,500 different watch styles in stock. Their track record is astonishingly good, and it must surely be the envy of some of their competitors.